(Family Features) Taking time in the fall to prepare your lawn for the colder months ahead will pay dividends come spring and allow you to enjoy lusher, greener grass when temperatures rise again. Providing nutrients to your lawn before cold weather strikes is good for strengthening roots and increasing the nutrients stored for an earlier spring green. While the top growth of grass stops, grass plants are storing nutrients and energy for the following season. To determine the best ratio of fertilizer for the soil in your yard, you should utilize a soil test. Otherwise, look for fertilizer with a nitrogen-phosphate-potassium (NPK) ratio of 3:1:2 or 4:1:2. When applying the fertilizer, make sure that you follow the application instructions and rate information on the package and use a calibrated spreader to apply the correct amount. It is also a good rule to apply the fertilizer in the fall about 2-3 weeks before the ground freezes so the plant can start to take up some of the nutrients. Instead of pacing the yard with a push spreader, consider a tow-behind spreader attached to your riding lawn mower or garden tractor. An attachment, such as a pull-type spin spreader from John Deere, can quickly distribute fertilizer evenly across your yard. Aerating, the process of removing plugs of soil and thatch from the lawn, is ideal in cooler months. It encourages deep rooting, improves water and nutrient penetration, and promotes growth of beneficial soil microorganisms. There are a variety of techniques you can use to penetrate the soil such as spiked shoes or spray-on liquids, but to most effectively aerate soil, attach a dethatcher, or a plug aerator behind a riding mower or tractor to remove plugs of soil from two to three inches deep. If you prefer not to rake or bag grass or leaves, mulching with a mower is an ideal alternative. Be sure to mulch leaves only when they are dry to avoid damp and wet leaves clumping or building up under mower decks. Remember that grass needs sunlight in the fall to help store food for winter, so don’t wait until your lawn is completely matted down with leaves to mulch. A thin layer of mulched leaves is ideal and helps add nutrients to the soil, reducing the need for fertilizer. Selecting the right mower with mulching attachments or features can save a great deal of time and help ensure a consistent layer of mulch across the yard. For example, John Deere 100-Series lawn tractors have three-in-one mowing decks, which allow you to choose to mulch, bag or allow side-discharge. Creating a compost pile allows you to turn organic material into rich soil. The fall season is a good time to create a compost pile with decaying yard matter, such as vegetables, grass clippings and leaves, which can provide nutrient-rich soil for spring planting. For best results, alternate layers of “brown,” or high carbon materials, with grass clippings. Using a rear bagger with your lawn mower or tractor will help make collecting grass clippings a breeze, and adding to your compost pile is as simple as backing up to the spot and unloading. Another optional mower attachment, the lawn sweeper, brushes leaves into a hamper, much like a broom and dustpan. Taking these steps will prepare your lawn for the winter and help it come back strong, healthy and beautiful in the spring. 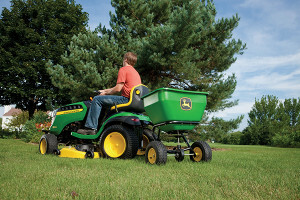 Learn more about the tools you need to care for your lawn at JohnDeere.com/Residential.